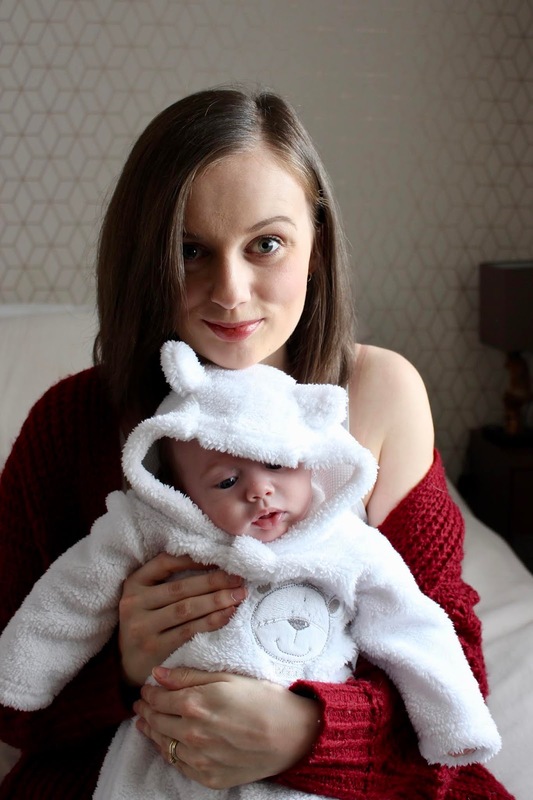 I’ve said right from the beginning that I want to be as open & honest about motherhood and I think the perfect way of doing so is letting you guys in on my weekly routine… The word routine being used very loosely here! Some of you might think it’s boring, others reassuring & relateable, but this is me… My week being parent to a newborn. 05.00 – Morning! This is where our week starts. Amelia tends to wake up between 4.00-5.00… Today it’s the latter meaning Dan & I get a little longer in bed. Thanks Amelia! 8:30 – Dan’s leaving for work now leaving me in control of the baby & the puppy. When I say puppy, that’s a lie because Willow’s almost four now, but she’ll always be a pupper to me… Plus it sounds like I’m doing a better job than I’m actually doing saying I’m looking after a puppy & a newborn! 9:45 – The cars packed, it’s taken over an hour but somehow I’ve managed to get myself ready, the baby ready & the dog ready to head off to a Beagle meet up at Poochie Park in Sherburn in Elmet. Bring on puppy cuteness and adult conversation. 10:30 – We arrive. It’s bitterly cold outside but we’re all wrapped up and having the best time watching the dogs run around together and enjoy themselves. It’s nice being able to do things like this as I don’t get to walk Willow as often or as far as what I used to. 12:00 – After the beagle meet up we head to Nikki’s new house for a coffee and some biscuits… Lots of biscuits! Amelia has a little cry, but nothing we can’t handle… If anything she’s better behaved than the dogs. 15:00 – Home time now & the day’s gone so quickly! I love having days like this as it feels like Dan’s never left. It’s so weird that I spend 10 hours a day from Monday-Friday solo parenting, sometimes it feels like it goes on forever, but today’s a good day! Todays whizzed passed in the blink of an eye. 18:00 – Family time! We end up having a pretty boring night tonight. By boring I mean Amelia’s actually been chilled. Boring nights in are actually a Godsend now! 23:00 – Bath, bottle & bed! I don’t know what we’ve done to deserve today, but Amelia’s been as good as gold! Bed time goes off without a hitch, let’s hope the rest of the week stays like that… Although I can bet your bottom dollar it wont! 06:30 – Amelia’s only just got up! I’m absolutely over the moon. This has been the longest she’s ever slept so hoorah for a full night’s sleep. Or as full a night as they’ll get at the moment – We can’t expect miracles now can we? 11:00 – I’m crying happy tears! Amelia’s being so cute right now it’s ridiculous. I’ve been pinching her cheeks and saying ‘cheeky cheeky’ and she’s been going nuts for it, she seems to like it, so I’m going with it. The cuteness lasts all of about an hour before it seemingly gets too much for her, and the tears come. I was reading before that her brain is going into sensory overload at the moment, she’s starting to develop all of these new emotions, but she doesn’t quite know how to handle them. The hour of cuteness however is SO worth the grizzle that’s about to come. 14:00 – This afternoon’s proving tough. I can’t seem to settle Amelia for some reason. She’s fed, changed, winded & cuddled but we can’t go 10 minutes this afternoon without crying. It’s afternoons like this I wish I had Dan with me. My emotions sometimes get the better of me when I’m on my own, this time thankfully everything’s under control. 17:45 – Dan gets in & instantly gets cracking on a Thai green curry – He’s such a good egg & it’s his speciality! We both manage to eat in peace as Amelia’s quiet as a mouse peeping in the Moses basket. This is a rarity so we’re making the absolute most of it! 18:30 – I spend the next 45 minutes in the bath, more catching up on social media and having a bit of time to myself rather than washing. I do wash eventually don’t get me wrong, but it takes a little while. My bath is interrupted by hearing Dan shout ‘Oh Amelia’ from downstairs. 19:10 – I make my way down, still in a towel to find what I can only describe as the biggest poo explosion I’ve ever seen. She’s stripped down, poo all over her arms, legs, up to her nips… Basicaly everywhere apart from her face and hair. Gross! 19:20 – Bath time… Understandably. 22:00 - Dan heads off to bed seeing as though he’s been up since 6am, leaving me slumped on the sofa with a sleepy baby on my chest. I’ve decided to start watching ‘Abducted under plain sight’ on Netflix, I’d seen people chatting about it on Twitter a few days ago & knew it sounded like a bit of me! I only manage to watch the first hour before my eyes start getting heavy and start doing some extra long blinks. 23:30 – Bedtime... And again everything goes without a hitch! Hallelujah! 02:00 – Amelia starts to stir, I spend 10 minutes pretending I’m asleep in the hope that Dan see’s to her; Alas it doesn’t work. Damn me for being such a light sleeper. I grab her from the Moses basket, give her a quick snuggle and off we pop downstairs for a bum change (where she wees on me fyi) and bottle. It takes me a little while to get her back to sleep this morning as she has a curious case of the hiccups. She’s always got those dastardly things – I’ve never known a baby get hiccups as much as Amelia does. 06:30 – She’s stirring again, this time I pop straight downstairs to make up a bottle and Dan feeds her while I catch up on a bit of sleep. I set my alarm for 07.20 in the hope of getting up and having a shower before Dan heads off to work… Spoiler alert… This doesn’t happen. 08.00 – Dan heads off to work leaving me with a milk drunk baby who luckily gives me an extra hour in bed. 10.00 – The first screaming match. I’m hoping this means she’ll have a quiet afternoon. That seems to be the case for the most part. She settles relatively quickly, with the promise of more milk, and I spend the next few hours catching up on Netflix… If you’ve watched ‘Abduction under plain sight’ please talk to me about it! I’m absolutely flabbergasted by it all. 12:30 – I manage to get Amelia down for a nap. She’s in the land of nod for just over an hour – Hallelujah – Giving me chance to write this blog post. Another rarity which I need to make the most of. 13:00 – Willow gets picked up for her weekly walk with Barbara. We’ve hired Barbara to walk our little pupper once a week to take a bit of the pressure off from me and so far she’s been absolutely brilliant. 13:30 – After a slow morning it’s time to finally get dressed and brush my teeth – Oops! I’m finding this to be the case for most days now, I’m either up and dressed before 7.30 or it’s really late in the afternoon – There doesn’t seem to be much in between. 13:45 – Bottle time! This time I can feel/see/hear/smell her pooping on me mid feed… The joys! 14:45 – Coffee number four… I may as well have it on an IV drip. Willow’s home now and she’s absolutely pooped. It’s so worth paying to have the dog walker as I’m unable to keep up with the masses of energy our little beagle bum has. 18:00 - Tonight’s tea is super lame, super easy cheese toasties! We love toasties though; we even included them in our wedding canapes. 20:00 – Monday night is usually our night to catch up on TV but for some reason this week it’s tonight. We’ve been watching ‘The secret life of 5 year olds’ and ‘SAS, who dares wins’ two totally different programmes, but one’s we’re totally hooked by. 23:00 - Bed time routine starts here as I make up Amelia’s last bottle for the day. A quick swig and she’s in what can only be described as a milk coma… The perfect state for getting her off to sleep. 04:00 – Up we get for the first feed. I don’t know how she does it, but Amelia always seems to wake exactly on the hour – It’s actually getting spooky now! 08:00 – Again like clockwork she’s up on the hour. 08:30 – Dan goes off to work, and this is where the crying starts – She turns out to be particularly grizzly this morning. For what reason, I don’t know, she’s fed, changed & cuddled, she’s just feeling a bit whingy this morning. I’ve just got to ride the wave. 09:00 – Being at home pretty much all day I’m on the lookout for new things to watch; Something I’m starting today is Gossip Girl… I’m only ten years behind! 13:00 – I’ve just clocked that the steriliser has broken…. Not what we need today, especially with such a grizzly baby. I’ve been on live chat with Tommee Tippee hoping to resolve the issue, fingers crossed I can get a replacement sooner rather than later. They’ve recommended we thoroughly descale it with distilled vinegar in the meantime but I’m doubtful that’s going to do anything. 15:00 – Six hours later & I’m still watching Gossip girl. I’m hooked! Although what is with Chuck Bass?... I don’t understand what sort of character he’s supposed to be?... Is he good looking?... Is he a bad boy?... Is he a secret romantic?... Answers on a postcard please. Oh and it’s totally obvious he’s going to end up with Blair! 15:30 – Amelia’s been asleep on me for a little while now, so in order to be productive I try and carry her across to her Moses basket. This lasts for all of about five minutes before the next crying session… There’s absolutely no blog work getting done this afternoon. Ooops! I’ve really struggled today with her, it feels like her crying has been none stop. There’s been tears from both momma & baby this afternoon. Motherhood realness right there. 17:30 – I start prepping tea with baby in the sling, it’s the only way I can get anything done this afternoon. Something I’m really struggling with at the moment is not having time to myself. I’ve spoken to loads of new mums though who have said the exact same thing as well. It’s difficult transitioning from a somewhat selfish life into one that’s totally selfless. 18:30 – Dan’s home with vinegar & it goes straight in the steriliser… Let’s hope it works… Spoiler alert… It doesn’t work. Of course. 20:00 – Dan takes over with Amelia so I can carry on with this blog post. I’m twenty minutes in and to be honest my head’s not totally in it. I feel like I’ve been dealing with the devil today and my head’s buggered. Twenty minutes of writing & I’m done. Time to enjoy some baby cuddles! 23:30 – We do the BBB routine (bath,bottle,bed) but it’s a bit of a no go tonight. I thought it would be, because she’s been so whingy during the day. She won’t stay in the Moses basket for any longer than ten minutes before screaming so Dan takes one for the team and decides to stay up with her. 05:00 – Dan wakes me up asking to take over looking after Amelia. While I’ve been upstairs in the land of nod he’s stayed downstairs with her keeping her company & trying to settle her. He assures me he’s had some sleep, how much though I’m not entirely sure. Eeek! I get up anyway and give her a bottle and change her nappy, she’s still wide awake at this point so we have some cuddles and a little play before eventually falling asleep. 10:00 – Wakey wakey! It’s just started snowing outside, thankfully it’s not laying, but it’s so bloody cold! Our house doesn’t seem to keep the heat in very well, especially downstairs, so we don’t really move from the sofa this morning, we’re keeping each other warm and cosy with lots of cuddles, coffee for me & warm milk for her. 12:30 – My sister’s visiting today! Hooray for adult conversation and an extra pair of hands! 15:00 – The weather’s had a complete 180 this afternoon, the snows gone and out comes the sunshine. It’s still ridiculously cold though so we all get wrapped up, Willow included, and head out for a dog walk, where Willow comes home with yet another found tennis ball. We’re building a little collection at the moment. 17:45 – Dan gets home just in time for the biggest poo explosion to date. It’s SO bad we’ve had to throw some of her clothes away! Why are babies so God darn disgusting. Just as we manage to clean the explosion the door knocks and in comes Jake with our Godson Zak. 17:00 – Friday seems to be takeaway night for me & Dan at the moment & tonight is no exception! 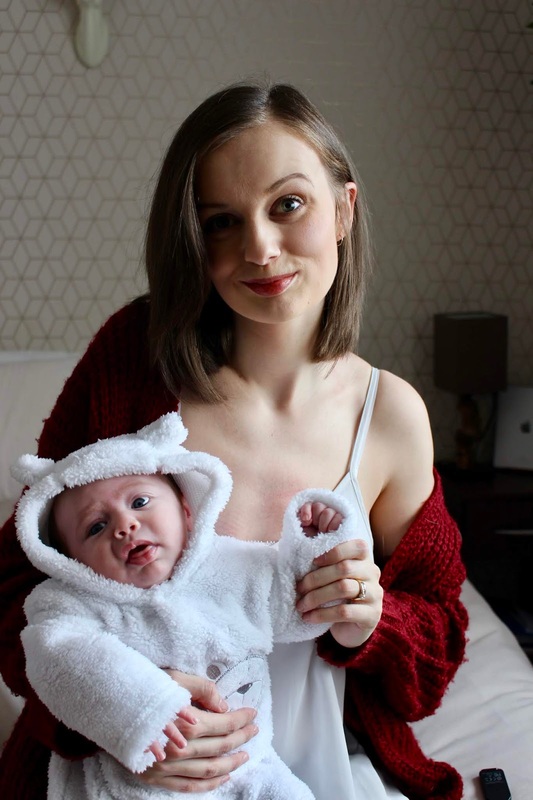 Pizza, chips, chicken wings, jalapeno poppers & drinks – We’ve mastered the eating one handed thing… Baby in one arm, chicken wing in the other… If that’s not peak parenthood, I don’t know what is. 23:30 – Bed time goes a lot smoother than yesterday – Thank the lord! 04:45 – Morning! Up we get for the first bottle of the day & a nappy change. I feel like I’ve really nailed the night feeds as we’re up for no longer than 45 minutes before I’m settling her back into bed… If anything it’s me that can’t get to sleep afterwards. I’m at the hair dressers later on today so I make sure to set my alarm for 7.15 so I’m up in time for my appointment. 08:15 – Somehow I’ve slept through my alarm! Thank goodness Amelia’s woken up otherwise I’d have been late. 09:00 – Hair time! Me time! Time for me to totally chill and unwind… No baby… No dog… No husband – It’s bliss! 10:45 – I make my return back home (bacon sandwiches in hand) to find Dan & Amelia being ridiculously cute together! She’s just started smiling, but with Dan being at work all day it’s not something he sees as much as I do, so watching him watch her is pretty amazing! It makes my ovaries burst! 12:00 – I’m back to writing a blog post! Hallelujah! Dan’s playing COD, Willows playing with her ball & Amelia’s asleep. I’m honestly living my best life right now! Not to mention I’m feeling particularly swish with my new hair. 14:00 – Time to wrap up and walk this puppy. I’ve mastered the art now of wrapping Amelia up in the sling, we’re ready to go in less than ten minutes – Something Dan’s very pleased about as he always says I take ages getting ready. 19:00 – I really don’t know where the day’s gone today… But I sit down to schedule some tweets ready for tomorrow’s #lbloggers twitter chat. 23.00 – BBB routine again. There’s something quite repetitive about this parenting lark isn’t there? 04:00 – Dan gets up to give Amelia her first bottle, he brings her back up to bed but for some reason she just wont settle. We have a super awake, super alert baby on our hands, it’s super cute, but part of me is willing for her to quuit it so we can go back to sleep. She’s definitely gotten cuter over the last week – And by that I mean she’s developing hr personality – The smiles are starting to come & she’s much more animated. 10:00 - Would you believe it?... We’ve managed to get some sleep! 14:45 – Swim time!... Last week was the first time Amelia stayed awake for the full lesson & this week is no different. In hindsight we probably should have started taking her when she was a little bit older, but it’s getting her used to the water & it’s lovely catching up with the other new parents & their babies. 16:00 – Another new weekly tradition seems to be the post swim McDonalds. 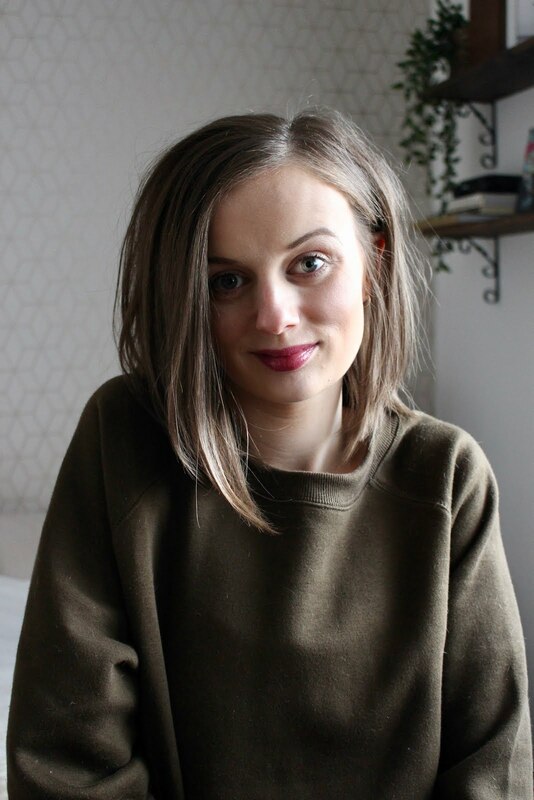 19:00 – I’m hosting the #lbloggers chat on twitter tonight. After running the #BDIB chat the year before last it’s something I definitely miss doing, but can’t commit quite as much time to as before - I host #lbloggers twice a month now which works perfectly for me. 20:00 – Now it’s time to wind down for the day. I have a milk drunk baby somewhat comatose on me, coffee in one hand & a chocolate bar in the other… My perfect night in! So there we have it, you might find it boring, you might find it 100% relateable, but this is what I get up to on a weekly basis. I don’t get much time to myself and I mostly smell of regurgitated milk, but this is me & I wouldn’t change a thing! What do you think? Can you relate to my week? Have you read my other parenting posts? My labour story – Welcome to the world Amelia May Chircop. 2 comments on "My week being parent to a newborn." We used to have last feed at 11pm too, then when food came in and number of bottles a day changed, I move the times.. Crazy, I know.lol We also have a dummy, which helps a lot. ps - Chuck Bass is 😍He is all of the above.